So me and the other half are trying to eat healthier (most of the time) and trying to lose some weight so we can get fit! It seems to be a constant battle though and some people make it look super easy. Losing weight is tough and if anyone tells you otherwise then they are either lying or haven’t gone through it themselves! There will be days you feel like ‘quitting’ or reaching for the domino’s pizza menu and you know what, that is okay. We all do it, we will all slip at times and we are allowed to treat ourselves. It’s just all about moderation, which is something we always hear right?! But it is true. So I have tried and tested so many things and now I’d like to share with you some of the healthy meals I find. This will help me not forget any meals I find or create myself! I have bought the ‘Lean In 15’ books by Joe Wicks aka ‘The Body Coach’ from Amazon, they are reasonably priced at only £7.99! This recipe is from his first book and is definitely one of my favourites. I make this in bulk for my lunches for work, so on Sunday I make a big massive pan (enough for 5 lunches each for 2 people) and tub them all up and pop them in the fridge. If you love chorizo then this meal is definitely for you! This recipe serves one, so alter the amounts for how much you want to make. Heat the oil in a pan (size depends on the amount you want to make, for me its huge!). Add the chorizo, chilli flakes and spring onions (this is where I also add peppers into mine) to the pan and fry for about 2 minutes, making sure you stir regularly. Pour in the tinned tomatoes and bring it to the boil, then let it simmer for 1 minute. Reduce the heat and you can then use your spoon to make two dipped holes in the tomatoes so you can crack your eggs into them. I only have one egg per portion and I cook mine separately in a pan at the end and just add it to the top of the meal, this is just easier for me. You pick however you prefer to do it. Sprinkle the parmesan over the eggs, if you are cooking yours in the tomatoes then pop a lid on top of the pan. Simmer for about 5-6 minutes or until the eggs are cooked to your liking. Then dish it up and enjoy! 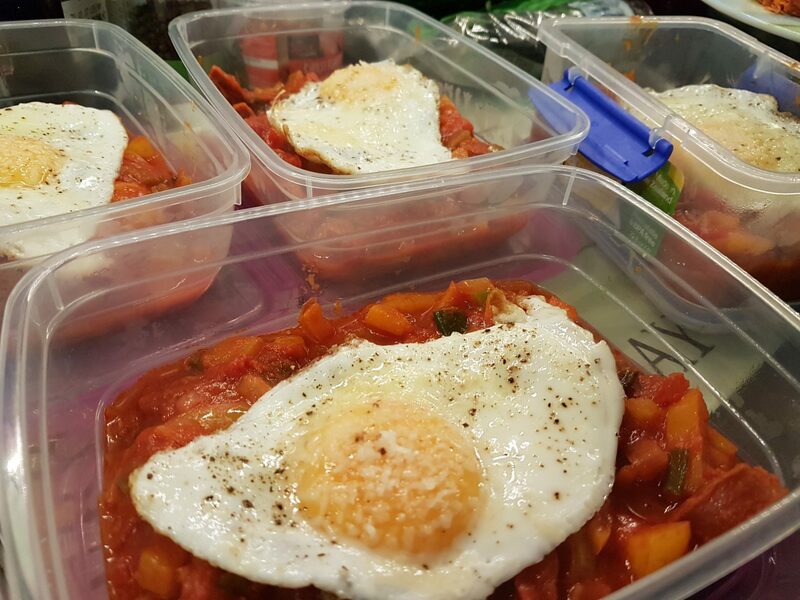 Or in my case, pop it into containers, add my eggs and then pop into the fridge to be enjoyed throughout the week! 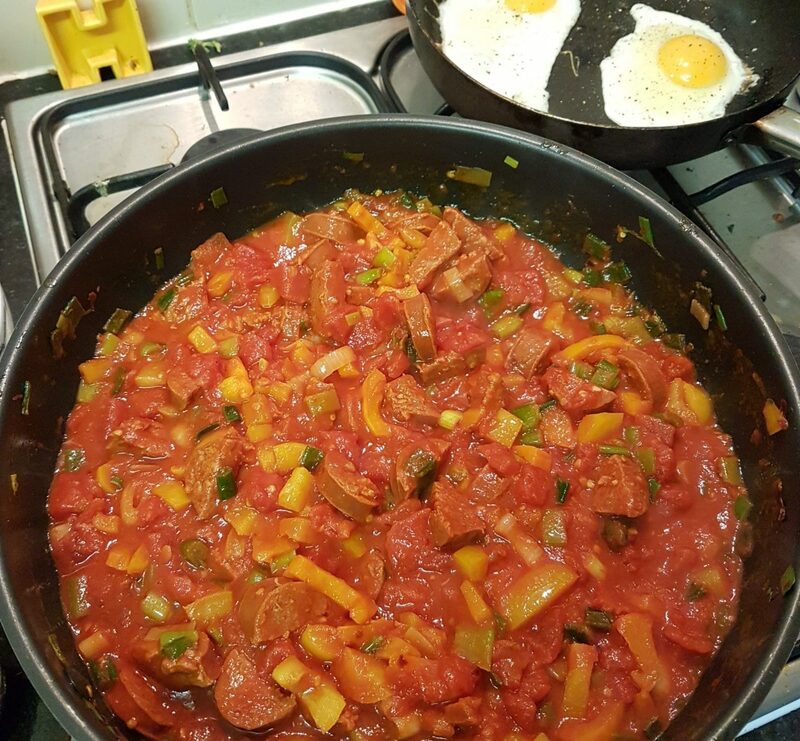 This meal is so quick and easy to make, I think the longest thing is actually cutting up the chorizo! When you have to cut up enough for 10 portions that is a lot of chorizo. It’s not as easy to cut as you would think. This is very tasty and I really enjoy this meal. We can’t have it all the time as it can be a bit pricey thanks to the chorizo.